Apart from working on getting my online store all setup and ready to go, I have also been working on a couple of small projects. The first was a beret, the first time I had ever knitted one! I was surprised at how quickly they knit up and was done within 24hrs. 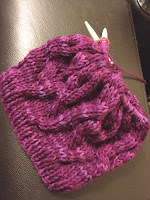 I chose a pattern off Ravelry, the lovely Star Crossed Slouchy Beret by Natalie Larson. I got my oldest to pick a colour and knitted the beret up for her. I didn't change the size though so it is a little bit loose for her as it's meant to be worn by an adult. I must admit, I have borrowed it from time to time too. It's amazing how much warmer you are with something on your head, especially when it's made of 100% merino wool! This was made in Manos del Uruguay's Rittenhouse which is a lovely and soft 5-ply yarn, in colourway Magenta. Definitely a favourite of mine from the Manos collection. Then I decided to use some yarn which I was sampling to knit up a cowl which I had promised to my friend, Ben Abraham, about a year ago. I used Twinkle Baby Chunky in Moss and found a cool manly cowl pattern to use. I modified the pattern quite a bit but essentially ended up with the same effect, just in a smaller size, using chunkier wool. Glad to say, it fitted Ben perfectly AND he loved it. Success! Now I just have to get him to model it for me so I can take some decent shots of it. Along with these 2 projects, I have still been working on a Rowan's Savannah Dune cardigan for myself. But that has been a bit slow going. Hoping to get it done by spring!